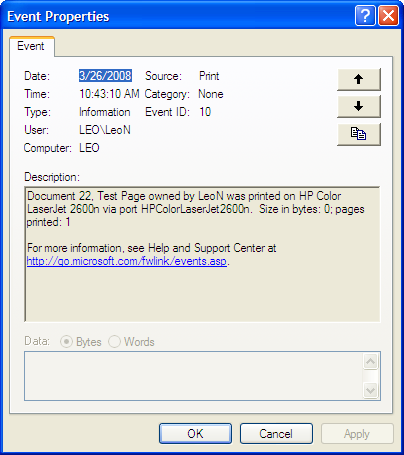 The computer that a printer is connected to can be configured to log all printing events to the System log. You can use Window's Event Viewer on that machine to see what documents have been printed, and by what user. That log can contain the name of your document, as well as the computer name and user name of the account printing it. If the printer is shared, of course the computer name would be the name of the remote computer accessing the shared printer. So, yes, while logs aren't guaranteed to exist (mine was off by default), they certainly can be enabled, and can contain some interesting information. Next we need to examine exactly how printing works. When you print a document it invokes something called the "print spooler". Rather than printing directly to the printer, the information that would be sent to the printer is actually written to (or "spooled") to disk, and sent on from there. Your application writes the printed document to the print spooler where it's placed in the queue of documents waiting to be printed. As prior documents finish printing yours moves ahead in the list, and finally prints when its turn comes. If the printer is remote - meaning that you're printing on machine A to a printer connected to and shared by machine B, then your document's print data is written to the spooler file on machine B. Regardless of where the spooled file lives, once your document has been printed, that file is deleted. There's no record of its content kept, and there's no way to simply say "print it again". This is where judicious paranoia might set in. We all know by now that files aren't really deleted, the disk space they used is simply marked as "available to be overwritten". Until that disk space is overwritten - you guessed it - the data could be recovered. It wouldn't be easy, and on a busy system it might not even be likely, but there is a possibility. Nothing, really. When you send data to another computer, any other computer, you're ultimately entrusting the owner of that computer with the possibility of full access to your data and printing to a shared printer is no different. This is one case where even encryption won't help; your printed document still needs to be decrypted on the remote computer in order to be printed. Ask Leo! - What is the Event Viewer, and should I care? Do you have an article on how to set up a remote printer? I quickly searched but didn't find anything.